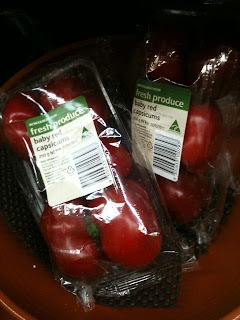 It's been a long time since this blog has been to the supermarket. Way back in November 2009 I got inordinately excited about insect sprays and cheap asparagus but since then there has been silence on the grocery shopping front. And for good reason. I don't like the supermarkets here, they're not a patch on Sainsbury's or Waitrose. 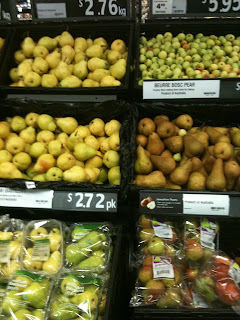 But, this week Woolworths has gone, quite literally, bananas. Despite floods, droughts, earthquakes, plagues of locusts and all the other natural disasters that have been besetting this continent its shelves are groaning with the most extraordinary displays of strange fruit and vegetables. Many miniaturised. And London simply cannot compare with Australia for fruit and veg. Take pears, for instance. Currently there seem to be about six different varieties in stock from dark-brown Beurre Bosc to greenish-yellow Josephines to yellow William Bartletts. And the weirdest of all - the Paradise Pear (also known as Faccia Bella). These are tiny, miniature pears, almost round, with a green skin blushed with red. And, as Woolworths say, ideal for lunchboxes...I have never seen the like. These little Paradise Pears are, indeed, paradisiacal and might save me from eating too many jellybeans. Much healthier. 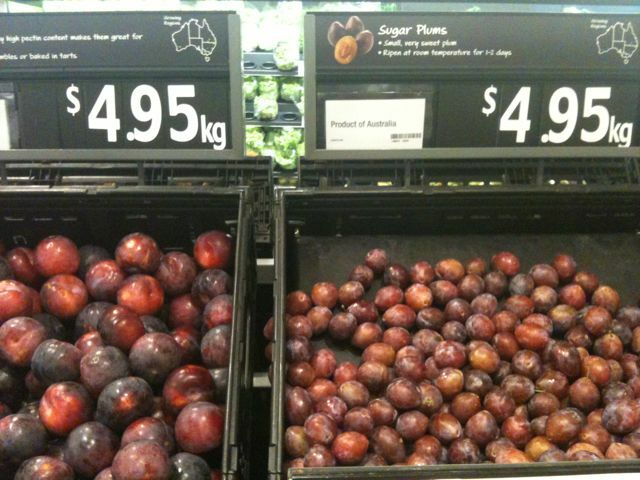 Plums are in season too. And again not just a single type of plum but many different varieties. We have blood plums (rich red in colour, obviously), the freaky plumcot (a cross between a plum and an apricot, unnerving I know), black plums, October Sun plums (green), Tegan Blue plums and Sugar Plums - the miniature variation, below on the right. Another good jellybean substitute, the sugar plum is intensely sweet and (I'm eating one right now) quite marvellous. Past the miniature bananas (Lady Finger variety) and we cross the aisle towards the veg. And lo and behold, it's Alice Through The Looking-Glass over here too. First up, the aubergine. 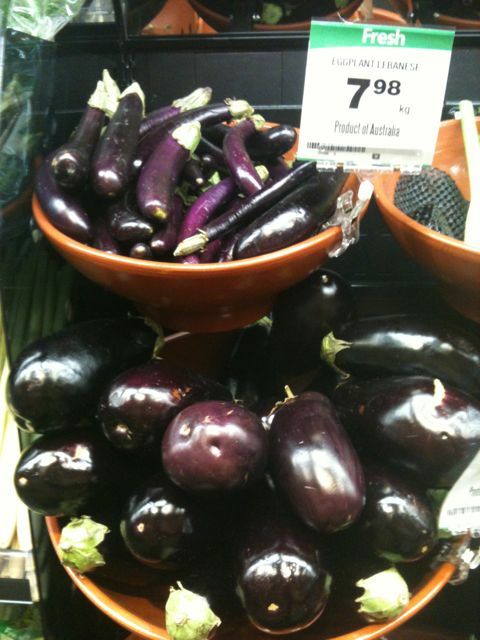 This is painful for me because aubergine is, frankly, the flesh of the devil and to have more than one variety is simply abhorrent. 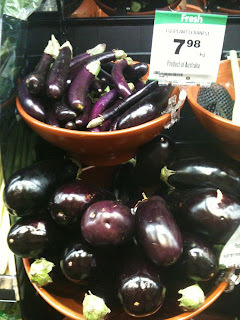 But there they are, nestling next to their fatter cousins, miniature little aubergines, specifically there to make me shudder. 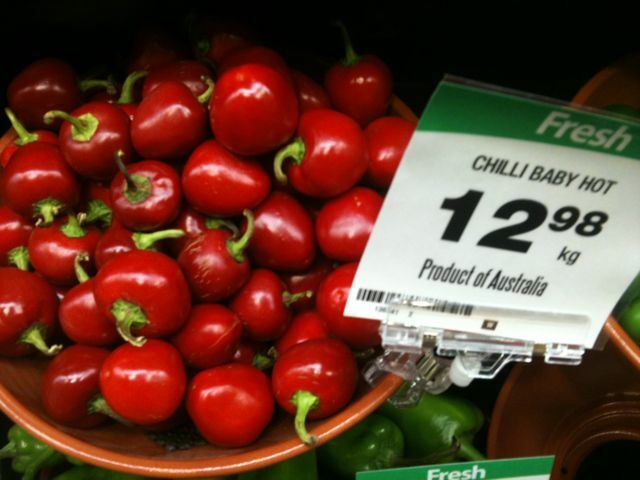 More congenial are the miniature chillies (one of seven fresh varieties today) and the miniature red peppers. 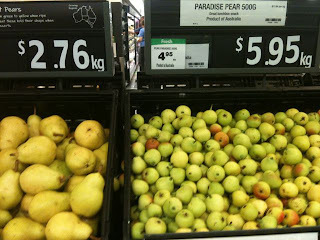 So, as you can see, despite the dire warnings of empty shelves and escalating prices which we were indundated with early in the year whilst the Queensland floods were in full spate, Australian farmers have somehow battled on to produce an amazing array of produce early this autumn. Here's to them (and to all things small)! I never realised that each morning I was spreading the devil's testicles on my toast. I'm so glad you enlightened me. Olives on toast Nicholas? testes of the devil Jonathan? Where did we GO WRONG?